Last month, a robotic bartender made its debut inside a futuristic-looking restaurant in Prague, where intrepid guests place orders via an app. And thus, a new robotic “arms” race was underway. While the Eastern European robot pours guests glasses of expensive wine, its American counterpart remains true to its roots, serving up ice cold Bud Light straight from the keg. The robot make its official debut in Mile High Stadium, the team said, where the Denver Broncos faced off against the Cleveland Browns. The machine will be at least the second known robot to pour fans beers inside an NFL stadium. In Florida, a robot produced by the robotics company FANUC and “employed” by the Jacksonville Jaguars has also been serving Bud Light to fans on game days. “Broncos Country will find out if robots do it better when the beer-dispensing Bud Light Bot debuts at the stadium in the United East Club level during the game,” the team said. 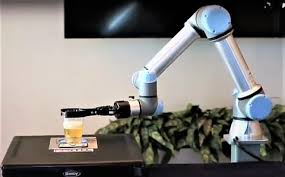 The mechanical arm — manufactured by Universal Robots and programmed by MSI Tec — serves beer from a machine that fills plastic cups from the bottom up using a magnet. The robot is programmed to start dispensing once two people push a button at the same time. Unlike a human bartender, the UR5e never spills a drop of beer, according to Mike Barrett, MSI Tec’s vice president. “The exciting thing behind Universal Robots is that they’re a collaborative robot intended to be used alongside humans,” Barrett said, noting that the machines are often used to do tedious process work, such as picking up parts over and over again. “They don’t need additional safeguarding like most industrial robots, which often have to be kept away from people behind big cages." Barrett said the Broncos discovered the robot during an event at a Denver brewery, where the UR5e’s pouring prowess was on display. The machine can be programmed in about an hour, the company says. Barrett said he would like to see the UR5e working inside NFL concession stands across America at some point, but he doesn’t foresee the robot replacing human jobs. “It certainly can operate autonomously, but it would still require someone to monitor the keg and make sure it’s operating properly, and that still means that it needs human interaction,” Barrett said. Several thousand miles away in the Czech Republic, the owner of the wine-pouring robot, Marcel Soural, told Reuters he’s convinced that robots will soon replace waitstaff all over the world, following a trend that has redefined the manufacturing world. On the other side of the country, in Boston, a restaurant that replaced human chefs with seven automated cooking bots that simultaneously whip up meals in three minutes or less has been a success. Opened in May by a group of 20-something robotics engineers from the Massachusetts Institute of Technology, Spyce recently announced $21 million in funding and plans to expand along the East Coast, according to Eater Boston. Asked whether he foresees any issues arising between drunk football fans and a robotic beer-pourer, Barrett chuckled.